ROBELINE, LA (KSLA) - Relief is on the way just in time for Christmas for hundreds of water customers in Robeline and Marthaville who have been without safe drinking water for three weeks. In an emergency meeting Thursday morning between the Delta Regional Authority, the Robeline-Marthaville Water System and Natchitoches Parish authorities, it was announced that the DRA has approved $27,000 in emergency funding to provide reliable drinking water to the 475 residents on the system. DRA's investment will be matched by $5,000 in funds from the water system to replace a 30-year-old water tank, which has begun to leak and resulted in a loss of water pressure. Previous requests for funding in the form of a loan to repair the aging system were denied by the state, according to water system president Tommy O'Con, who said he even spent Monday afternoon canvassing local banks in Many and Natchitoches in search of another way to borrow the money. "We are grateful for the DRA's immediate approval of our request to fund a new pump that will deliver running water to all residents and businesses on our system," O'Con said in a statement posted to the water system Facebook page late Thursday morning. "This allows us to purchase the pump today and install it immediately to provide running water just in time for the holidays." O'Con said water should be back up and running for all customers by Thursday night or Friday. Thursday's emergency meeting was the product of a 36-hour coordinated effort. 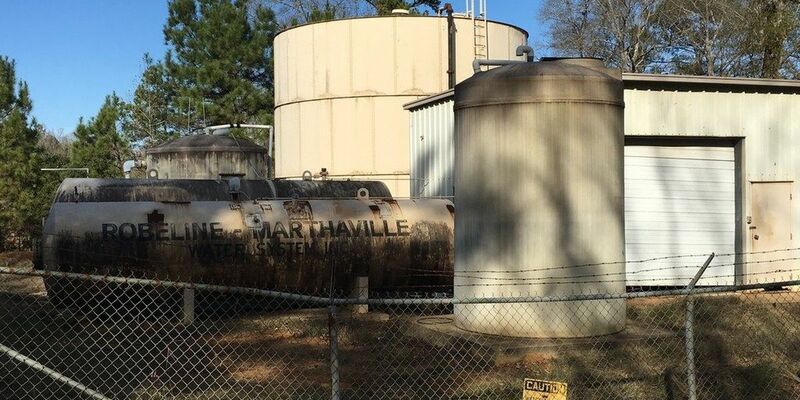 Knox Ross, the president of Shreveport's Coordinating and Development Corporation, read about he water problems facing Robeline and Marthaville and wanted to help. "That's what we do. Our mission is to help the parishes and municipalities of northwest Louisiana," said Ross. "He got the ball rolling, contacted Parish Council President Rick Nowlin," O'Con said. Nowlin then called the DRA who dispatched Governor John Bel Edwards' designee, Leslie Durham, to the town to hold the meeting. "I'm dealing with my own situation literally at my house with St. Joseph and we can't drink the water. We can't boil the water," Durham told KSLA. "When I found out about this, it absolutely got to me." The Robeline-Marthaville Water System experienced a "catastrophic failure of its main pressure water tank," the Water System said in its application for DRA funding. Buying a new pump will return reliable potable water to customers, including the 370-student Marthaville Elementary and Junior High School. Durham told KSLA the DRA will reconvene with water system leaders and parish authorities on January 5th at the Natchitoches Parish Courthouse to discuss a more permanent water solution for the people. "Don't settle for this. We want better rates. We want better water," she said. The Delta Regional Authority is a federal-state partnership created by Congress in 2000 to help create jobs, build communities, and improve lives through strategic investments in economic development in 252 counties and parishes across eight states. To date, the DRA's SEDAP investments, together with its state and local partners, have leveraged $138 million in federal resources into more than $2.9 billion in public and private investment into local small business owners, entrepreneurs, workers, and infrastructure development projects. These investments have helped create or retain more than 26,000 jobs since the DRA was established. Learn more at dra.gov.